Regular readers shouldn't be surprised that I took some time yesterday to visit the D.C. Streetcar Showcase, going on through this Saturday at the corner of 9th & H Streets NW near Gallery Place. The District Department of Transportation is embarking on an ambitious, ten-year plan to build 37 miles of streetcar lines across the city - and to gin up support for the project, they're putting one of their recently-purchased streetcars on display for all to come and see (and smell). And of course, all of my fellow geeky urban planning bloggers came out as well, cameras in tow. Much as I love the National Capital Trolley Museum right here in East County, it's a bummer that we aren't able to ride one in real life, especially after seeing how awesome and efficient they are in cities like Portland, San Francisco and Philadelphia, where I will ride the streetcar all day long when I move there. While the plan is confined to the city limits for now, I'm hoping that we'll see the Georgia Avenue streetcar line continued to Silver Spring. That's where they once ran many, many decades ago and first kick-started the development of what we now call Downtown Silver Spring. In the future, it'll give East County residents a new way into the city and to great shopping, dining and entertainment destinations that are kind of hard to reach from the Red Line, like Petworth, Columbia Heights and on U Street. We won't see any streetcars running in D.C. until 2012 at the earliest, but in the meantime, check out this photoset. 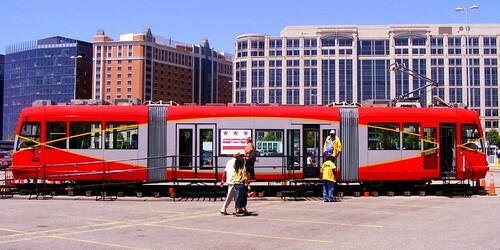 And you can visit the Streetcar Showcase yourself at the corner of 9th & H NW near the Gallery Place Metro station. Not only did the trolley used to run to downtown Silver Spring, it continued up Georgia Avenue to Montgomery Hills and then went to Forest Glen. Service came to an end when the original underpass for Georgia Avenue was built in 1925. Don't write "Downtown Silver Spring" with a capital "D". That refers to the confusing name of the Ellsworth development, not downtown Silver Spring with a little "d". You're absolutely right. Originally, whenever I wrote about the area around Ellsworth Drive, I referred to it as the "Downtown Silver Spring complex, and the area as a whole I'd call "downtown Silver Spring" or "the Silver Spring CBD." It's frustrating that Peterson would give their development the same name as the area it's located in. Of course, Rockville Town Square suffers from a similar issue - the complex itself is located in Rockville Town Center, and the actual, physical square itself is called "Rockville Town Square Plaza," just because the City didn't think people would get the message.